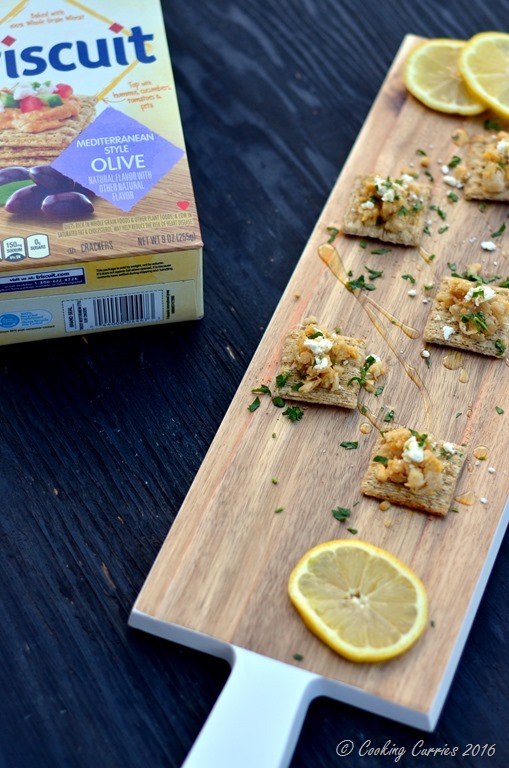 A burst of Mediterranean flavors in every bite in this Smashed Chickpeas, Feta and Lemon TRISCUIT. Great as an everyday snack as well as a dressed up appetizer for a party! Summer time is picnic time for us and I am always coming up with new recipes that can be bite-sized, transportable and most of all fun to eat! We also entertain a lot in summer. Backyard parties, barbecues, picnic parties, brunches and what not! I like to add recipes to my growing repertoire of recipes and I especially love it if the same recipe falls into many categories – picnic food, entertaining, everyday snack etc. 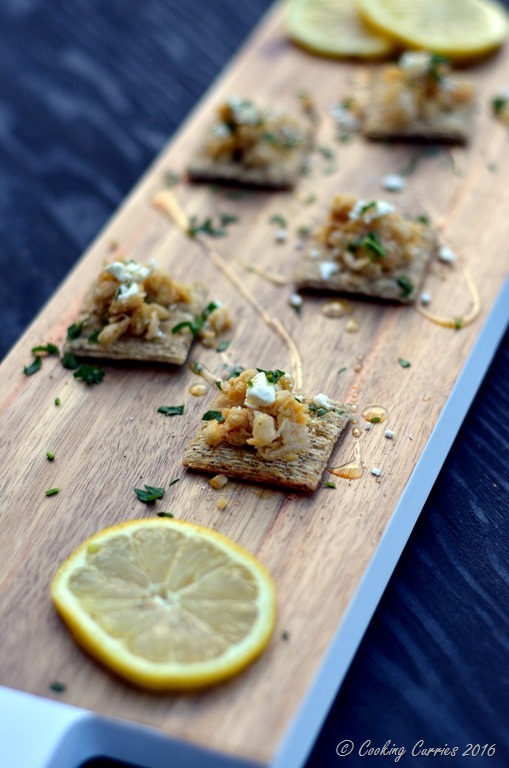 These Smashed Chickpeas, Feta and Lemon TRISCUIT, ChickLemonCheescuit, are just that. They can be a quick after work or after school snack, or be taken for picnic or can be an elegant appetizer for entertaining. It is like one of those day to evening dresses! The new TRISCUIT artisan line had so many varieties that I had a hard time choosing. They all looked so good – the TRISCUIT Sriracha Crackers,TRISCUIT Smoked Gouda Crackers and the TRISCUIT Mediterranean Olive Crackers.I had to force myself to settle with the TRISCUIT Mediterranean Olive crackers and the TRISCUIT Original crackers for the time being, till I head over to the store again. 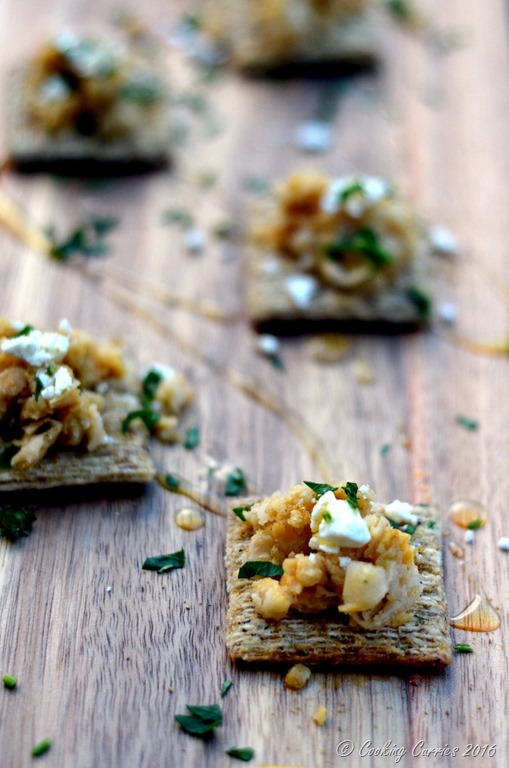 The endless possibilities for toppings for these crackers was so exciting and I couldn’t wait to get back home to try them out. Not before I grabbed a few more essentials from Wal-mart. Whenever I think of Mediterranean flavors the first things that pop into my head are chickpeas, lemon, mint, feta, harissa, parsley, dates and olives. Now I had to pick a few from those that will elevate the TRISCUIT but also not become too overwhelming in a mouthful. I smashed up some canned chickpeas, seasoned them and topped the TRISCUIT with a little of those, added some crumbled feta to it, squeezed some lime over it, added a pinch of cumin and drizzled olive oil over them. And lastly dusted with some minced parsley for some much needed color and flavor. Every bite of that was a burst of flavor taking me to the beaches and vineyards of the Mediterranean all at the same time! 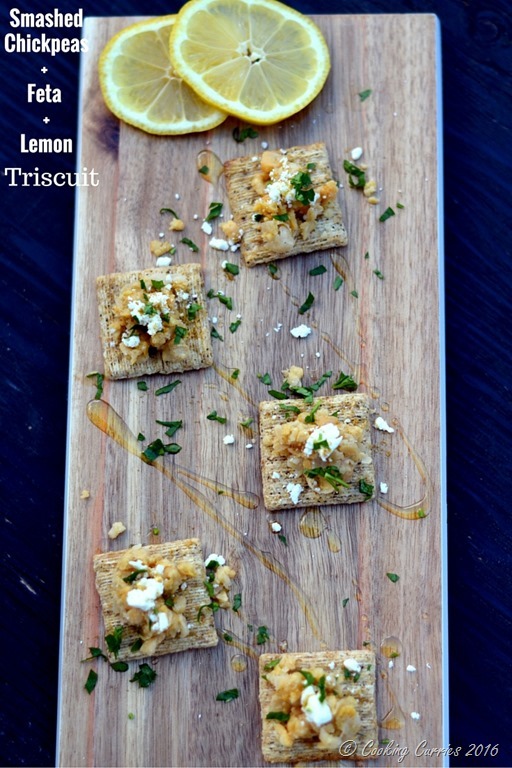 Don’t forget to check out TRISCUITs website for more inspiration! Smash the chickpeas with the back of a spoon and season with salt. Arrange the TRISCUIT on a serving platter. Top each with a little of the smashed chickpeas. Add some crumbled feta and sprinkle some cumin. Squeeze lemon over the crackers and drizzle the olive oil. Garnish with the minced parsley and enjoy! Looks delicious! I’m such a fan of Triscuits too!